Open your heart. Experience the joy. Share the journey. Be God's love. Holy Family Service Corps is an extension of the mission of the Sisters of the Holy Family of Nazareth. As an international congregation of consecrated women religious, we are dedicated to furthering God’s love through service to the family. In union with the Sisters, our volunteers “share in the joys and hopes, sorrows and fears of the People of God…work toward the creation of one family in God wherever they serve…commit to enhancing the quality of family life…promote the rights of the disadvantaged and powerless and encourage each other to trust that in every situation, God uses us as instruments by which the Gospel of love and peace is proclaimed” (Covenant of Love, Life of Service #5.3-5.8). Tell us your passion and we'll connect you to those in need! 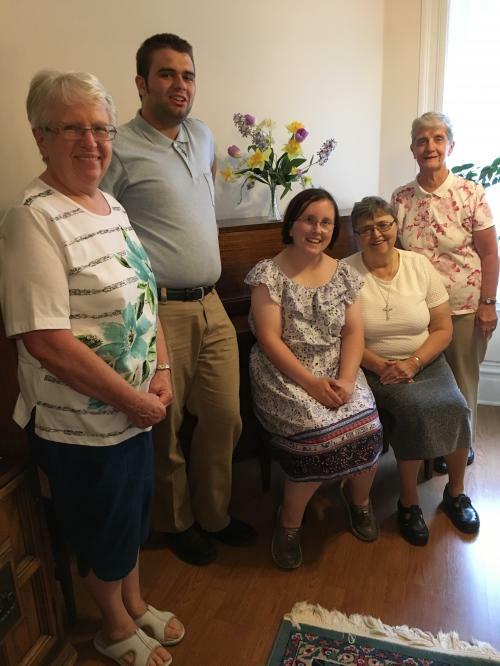 As a Service Corps volunteer, whether part of a short term experience or as a year-long volunteer, you will have the opportunity to interact with the Sisters of the Holy Family of Nazareth, learning through their lives the core values of faithful listening, loving relationships and discovering God in the ordinary experiences of daily life. Holy Family Service Corps ties together the gifts of prayer, service and community to offer its volunteers a powerful opportunity to BE the change they want to see in the world! Come and explore our Holy Family Service Corps! Short term and long term service opportunities await! Discover how you can join with others in building up the Family of God! For more information, please complete the form below or contact Sr. Michele Vincent Fisher at sorellamichele@aol.com. I am a college graduate and am interested in a one year service opportunity. Our ministry/mission group is interested in a short-term service project.